By Bella, from Tracy Weber's Downward Dog Mystery Series. Hi Everyone! Bella here, from Tracy Weber's Downward Dog Mystery series, sharing some beach scenery from my newest adventure, Pre-Meditated Murder! I'm camera shy, so Tracy's crazy pup, Ana, is standing in as my body double. The first thing any self-respecting canine does at the beach is to leave her mark in the sand. Every now and then, she has to stop and stare adoringly at her favorite human pal. And a fabulous rock formation called Haystack Rock. This photo was taken when Ana was a puppy. Don't forget a sailor statue perfect for photo opps. But you can visit over and over again in my newest adventure! Tracy and I hope you'll give it a read. You'll never believe the trouble Kate's gotten herself into this time! Go on, buy yourself a copy of Pre-Meditated Murder You know you want to! Ana is gorgeous and Bella is the name of my nephew's German Shepherd. Love this series and love Ana Pup too! Thanks for sharing the great photos! Ana looks to be having a blast on the beach as I'm sure Bella does. This is a wonderful story and series. Thanks, all! 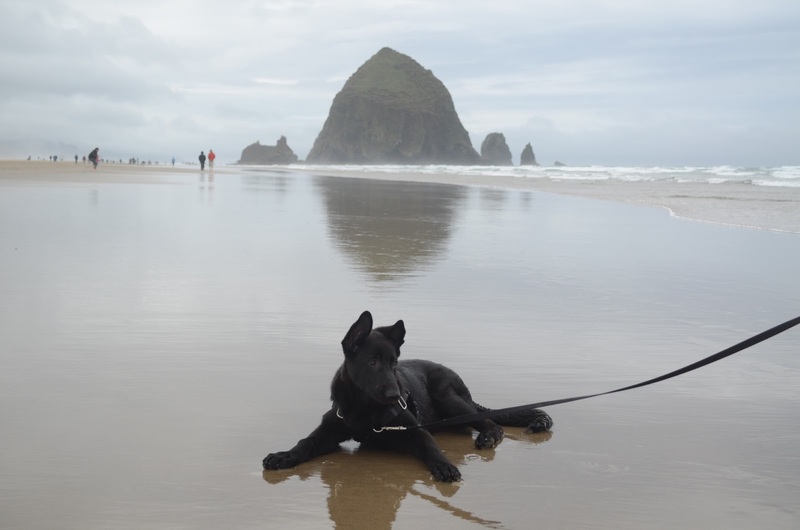 Ana ADORES the beach, and of course both she and Bella steal the show wherever they go. I LOVED this book. It was my favorite one in the series so far. I love Ana! Thank you for sharing your pictures!